A digital cranial endocast of Pucadelphys andinus, a Paleocene metatherian from Bolivia, is described. This is the first cranial endocast described for the taxon and the only one (to date) from a stem marsupial (i.e., non-marsupial metatherian). 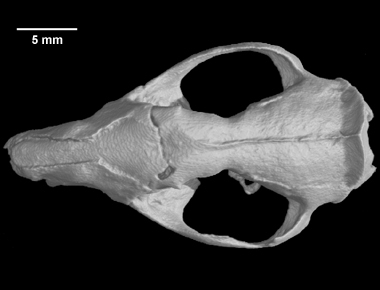 The Pucadelphys endocast is compared with others generated from skulls from six taxa of extant marsupials (Monodelphis domestica, Didelphis virginiana, Dasyurus hallucatus, Vombatus ursinus, Phascolarctos cinereus, and Dromiciops australis). The Pucadelphys endocast is generally similar to the didelphid marsupial Monodelphis. However, the olfactory bulb casts and the cerebellar space (approximated using vermis cast length) of Pucadelphys are relatively large in comparison to those of these extant marsupials. The cerebral hemisphere casts of Pucadelphys are dorsoventrally thin in comparison to those of the extant marsupials examined here. With other dimensions of the cerebral hemisphere casts being comparable between Pucadelphys and the extant marsupials, this suggests that the overall volume of the cerebral hemispheres was smaller in Pucadelphys. Thus, two possible synapomorphies for crown Marsupialia are a decrease in size of the cerebellar space and an increase in cerebral hemisphere volume. This specimen was collected from a site called "the Quarry" in the lower Paleocene Santa Lucia Formation at Tiupampa, Mizque Province, Department of Cochabamba, south-central Bolivia. It was made available to the University of Texas High-Resolution X-ray CT Facility for scanning by Drs. Christian de Muizon of the Muséum national d'Histoire naturelle (Paris) and Richard Cifelli of The University of Oklahoma. Funding for scanning was provided by Dr. Timothy Rowe of The University of Texas at Austin. The specimen was scanned by Richard Ketcham in the spring of 1997 along the horizontal axis for a total of 115 512x512 pixel slices. Each slice is 0.10 mm thick, with an interslice spacing of 0.10 mm and a field of reconstruction of 35.1 mm. Brochu, C. A. 2000. A digitally-rendered endocast for Tyrannosaurus rex. Journal of Vertebrate Paleontology 20:1-6. Colbert, M. W., R. Racicot, and T. Rowe. 2005. Anatomy of the cranial endocast of the bottlenose dolphin Tursiops truncatus, based on HRXCT. Journal of Mammalian Evolution 12:195-207. Denison, C., W. D. Carlson, and R. A. Ketcham. 1997. Three-dimensional quantitative textural analysis of metamorphic rocks using high-resolution computed X-ray tomography: Part I. Methods and techniques. Journal of Metamorphic Geology 15:29-44. Edinger, T. 1942. The pituitary body in giant animals fossil and living: a survey and a suggestion. Quarterly Review of Biology 17:31-45. Edinger, T. 1964. Midbrain exposure and overlap in mammals. American Zoologist 4:5-19. Eisenberg, J. F. 1981. The Mammalian Radiations. University of Chicago Press, Chicago, Illinois, 610 pp. Franzosa, J. W., and T. Rowe. 2005. Cranial endocast of the Cretaceous theropod dinosaur Acrocanthosaurus atokensis. Journal of Vertebrate Paleontology 25:859-864. Horovitz, I., and M. R. Sánchez-Villagra. 2003. A morphological analysis of marsupial mammal higher-level phylogenetic relationships. Cladistics 19:181-212. Hurlburt, G. R. 1996. Relative Brain Size in Recent and Fossil Amniotes: Determination and Interpretation. Ph.D. dissertation, University of Toronto, Toronto, Canada, 250 pp. Jerison, H. J. 1973. Evolution of the Brain and Intelligence. Academic Press, New York, New York, 482 pp. Jerison, H. J. 1991. Fossil brains and the evolution of the neocortex; pp. 5-19 in B. L. Finlay, G. Innocenti, and H. Scheich (eds. ), The Neocortex: Ontogeny and Phylogeny. NATO Advanced Science Institutes Series A: Life Sciences Vol. 200, Plenum Press, New York, New York. Kielan-Jaworowska, Z. 1986. Brain evolution in Mesozoic mammals; pp. 21-34 in K. M. Flanagan, and J. A. Lillegraven (eds. ), Vertebrates, Phylogeny, and Philosophy: Contributions to Geology, University of Wyoming, Special Paper 3. Kielan-Jaworowska, Z., R. L. Cifelli, and Z.-X. Luo. 2004. Mammals from the Age of Dinosaurs: Origin, Evolution, and Structure. Columbia University Press, New York, New York, 630 pp. Krause, D. W., and Z. Kielan-Jaworowska. 1993. The endocranial cast and encephalization quotient of Ptilodus (Multituberculata, Mammalia). Palaeovertebrata 22:99-112. Larsson, H. C. E., P. C. Sereno, and J. A. Wilson. 2000. Forebrain enlargement among nonavian dinosaurs. Journal of Vertebrate Paleontology 20:615-618. Loo, Y. T. 1930. The forebrain of the opossum, Didelphis virginiana. Journal of Comparative Neurology 51:13-64. Luo, Z.-X., Z. Kielan-Jaworowska, and R. L. Cifelli. 2002. In quest for a phylogeny of Mesozoic mammals. Acta Palaeontologica Polonica 47:1-78. Luo, Z.-X., Q. Ji, J. R. Wible, and C.-X. Yuan. 2003. An Early Cretaceous tribosphenic mammal and metatherian evolution. Science 302:1934-1940. Macrini, T. E., and T. B. Rowe. 2002. Ontogenetic variation in endocasts of Monodelphis domestica and implications for the fossil record. Journal of Vertebrate Paleontology 22(3, Supplement):81A. Macrini, T. E., and T. B. Rowe. 2005. Preliminary comparison of cranial endocasts of marsupials. Society for Integrative and Comparative Biology 2005 Annual Meeting Final Program and Abstracts, San Diego, California, p. 182. Maisey, J. G. 2004. Endocranial morphology in fossil and recent chondrichthyans; pp. 139-170 in G. Arriata, M. V. H. Wilson, and R. Cloutier (eds. ), Recent Advances in the Origin and Radiation of the Vertebrates. Verlag Dr. Friedrich Pfeil, Munich, Germany. Maisey, J. G. 2005. Braincase of the Upper Devonian shark Cladoides wildungensis (Chondrichthyes, Elasmobranchii), with observations on the braincase in early chondrichthyans. Bulletin of the American Museum of Natural History 288:1-103. Marshall, L. G., and C. de Muizon. 1988. The dawn of the age of mammals in South America. National Geographic Research 4:23-55. Marshall, L. G., and C. de Muizon. 1995. Part II. The skull; pp. 21-90 in L. G. Marshall, C. de Muizon, and D. Signogneau-Russell (eds. ), Pucadelphys andinus (Marsupialia, Mammalia) from the early Paleocene of Bolivia. Mémoires du Muséum National d’Histoire Naturelle 165. Marshall, L. G., and D. Sigogneau-Russell. 1995. Part III. Postcranial skeleton; pp. 91-164 in C. de Muizon (ed. ), Pucadelphys andinus (Marsupialia, Mammalia) from the early Paleocene of Bolivia. Mémoires du Muséum National d’Histoire Naturelle 165. Marshall, L. G., C. de Muizon, and D. Sigogneau-Russell. 1995. Part I. The locality of Tiupampa: age, taphonomy and mammalian fauna; pp. 11-20 in C. de Muizon (ed. ), Pucadelphys andinus (Marsupialia, Mammalia) from the early Paleocene of Bolivia. Mémoires du Muséum National d’Histoire Naturelle 165. McManus, J. J. 1974. Didelphis virginiana. Mammalian Species 40:1-6. Muizon, C. de. 1998. Mayulestes ferox, a borhyaenoid (Metatheria, Mammalia) from the early Paleocene of Bolivia. Phylogenetic and palaeobiologic implications. Géodiversitas 20:19-142. Nowak, R. M. 1991. Walker’s Mammals of the World. Volume 1. Fifth edition. The Johns Hopkins University Press, Baltimore, Maryland, 642 pp. Rowe, T. 1996a. Brain heterochrony and origin of the mammalian middle ear; pp. 71-95 in M. Ghiselin, and G. Pinna (eds. ), New perspectives on the history of Life. California Academy of Sciences, Memoir 20, San Francisco, California. Rowe, T. 1996b. Coevolution of the mammalian middle ear and neocortex. Science 273:651-654. Rowe, T., W. Carlson, and W. Bottorff. 1995. Thrinaxodon: Digital Atlas of the Skull. CD-ROM (Second Edition, for Windows and Macintosh platforms), University of Texas Press, Austin, Texas, 547 megabytes. Rowe, T. B., T. P. Eiting, T. E. Macrini, and R. A. Ketcham. 2005. Organization of the olfactory and respiratory skeleton in the nose of the gray short-tailed opossum Monodelphis domestica. Journal of Mammalian Evolution 12:303-336. Sánchez-Villagra, M. R. 2002. The cerebellar paraflocculus and the subarcuate fossa in Monodelphis domestica and other marsupial mammals–ontogeny and phylogeny of a brain-skull interaction. Acta Theriologica 47:1-14. Smith, R. J. 2005. Relative size versus controlling for size. Interpretation of ratios in research on sexual dimorphism in the human corpus callosum. Current Anthropology 46:249-273. Szalay, F. S., and B. A. Trofimov. 1996. The Mongolian late Cretaceous Asiatherium, and the early phylogeny and paleobiogeography of Metatheria. Journal of Vertebrate Paleontology 16:474-509. Tykoski, R. S., T. B. Rowe, R. A. Ketcham, and M. W. Colbert. 2002. Calsoyasuchus valliceps, a new crocodyliform from the Early Jurassic Kayenta Formation of Arizona. Journal of Vertebrate Paleontology 22:593-611. Van Valkenburgh, B., J. Theodor, A. Friscia, A. Pollack, and T. Rowe. 2004. Respiratory turbinates of canids and felids: a quantitative comparison. Journal of Zoology (London) 264:281-293. Witmer, L. M., S. Chatterjee, J. Franzosa, and T. Rowe. 2003. Neuroanatomy of flying reptiles and implications for flight, posture and behaviour. Nature 425:950-953. Click on the thumbnail to the left for a pitch animation (1.9 mb) of the Pucadelphys cranial endocast highlighted in red within the skull, which is rendered semi-transparent. Click on the thumbnail to the left for a pitch animation (1.5 mb) of the isolated Pucadelphys cranial endocast. Click on the thumbnail to the left for a roll animation (2.2 mb) of the Pucadelphys cranial endocast highlighted in red within the skull, which is rendered semi-transparent. Click on the thumbnail to the left for a roll animation (1.9 mb) of the isolated Pucadelphys cranial endocast. To cite this page: Dr. Ted Macrini, Dr. Christian de Muizon, Dr. Richard Cifelli, Dr. Timothy Rowe, 2007, "Pucadelphys andinus" (On-line), Digital Morphology. Accessed April 25, 2019 at http://digimorph.org/specimens/Pucadelphys_andinus/.